I am between a 6-7 at being mechanically inclined, is this job something I can handle? Is there a tutorial on this site with step by step and specs? If I'm going to tear into this baby looking for the cause of my fuel leak I might as well do the carbs too. BTW, I bought this bike last Sunday (1982 GL1100i with 9950 miles on it) for $1400.00, did do alright? 9950 miles for $1400? You'd better be looking over your shoulder before the police find you for stealing that bike! I haven't done an overhaul on my carbs (haven't needed to, thankfully) so I haven't got any details on doing it. However, if/when I do, I will be purchasing this rebuild kit and guide, which is pretty well known as the best carb rebuild kit available. Randakk is pretty well the carb guru when it comes to GL1100's and GL1000's. The kits mentioned are 2-5 times more than the kits I've been seeing, are they that much better? I'm not going to buy bottom of the line, I found a keystar brand kit that runs $82.00 for all four. Hey there, Read Randakks tips before you purchase any Kit and you will see why his are so much more, You my still buy Napco or Keyster but you will know what your getting and what you are not, I just helped a friend who bought Barracuda from China and he will have to pull the carbs AGAIN, leaks like a sieve? I'm learning alot from this site Wing admin is Great Good luck , David in CA. Don't want to bust youir bubble but it's likely that's 109,995 miles unless it was stored for 25 years. First job is to change the timing belts if one breaks it all over. If the bike runs you might try some sea foam in the gas and run a tank or two it may clean up youir problem. leaking carbs internally are usually from a stuck/dirty float needle. If it has been leaking for awhile you probably have gas in your oil..change it. Leaking externally bad bowl gasket. You were close, it was stored for almost 20 years and then a 70 year old man bought it 4 years ago to restore. He realized he bit off more than he could chew and sold it to me. I picked up the timing belts this morning (Gates), valve cover gaskets are on order as well as carb synchronizing gauges and a genuine Honda service manual. The old feller told me he took the carbs off and had them rebuilt but if I'm going to go through taking them off to find the leak I might as well rebuild them. Air filter, oil change, and coolant change are all on the list for the next two weeks as well as the carbs and timing belts. I think you guys have talked me into the better carb kits. O.K. I just bit the bullet on the Randakks kit plus the manual, I just hope the bonehead that already tried to rebuild these carbs DIDN'T change the jets and seats! I plan on documenting the process with pictures and notes. If it goes well I'll share, if not you will never hear about it. Well, it's been a year. I guess it did not go well . If it did could you post to let us know? Sorry for the delay in reposting. The rebuild did and didn't go well. The carbs were not rebuildable, bent linkages and jets, stripped screws, cross over pipes crimped and on and on. I found a set on ebay for $100.00 and I rebuilt them and the bike runs awesome. The only remaining issue is a tiny oil leak on the left side, and we're talking one drop on my boot after hours of riding and none on the garage floor. I suspect it is coming from the valve cover screw seals, once I find a nice set of chrome replacements I'll change the covers, gaskets and screw seals all at once. Hello all. 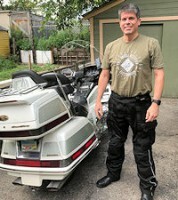 I am a Goldwing addict, and just bought another 1983 Wing. I now have a full blown 83 Interstate, and now a striped down bare-bones 83. The old girl was sitting a long time, so I have the carbs off for a rebuild. I have a question that has been pestering me for some time, and I have not found any discussion on this site about it: I have a cheap set of carb cleaning rods and brushes that work well for most of the carb jet holes. However, that dern idle jet with only 4 small holes in the side, and has a super small pin-hole from the jet head (where you insert a screwdriver to adjust) which goes through the brass jet and comes out the other side near the 4 holes on the jet. That hole is even smaller than the size of the 4 super-small holes on the jet. The only thing I can find to attempt to poke thru it in order to clean the crapola out is a piece of wire from an old wire brush. What does everyone else use to clean those idle jets??????? Surely there is a carb tool kit designed for all these jet holes, right?????? I use a guitar string, the smallest one on the guitar.Works good for me! 4wred........A guitar string.....Well, I never learned how to play a geetar, so I dont have one in the house to steal the string from. You sure the smallest one will fit in that small jet? I will have to go down to Nashville and borrow a geetar from Elvis, and return it less one string. OK............. The idle jet if stock should be a #35. That means it is .35mm in diameter so you are looking for (in inches) a .013 or smaller. I use light gauge strings on my guitar so I have a .010 from the high E position that I use for cleaning the idle jets. Indianakid.......The strange thing is that the 4 small holes on the jet's brass barrell do allow the smallest carb cleaning rod to go thru.......but the lenghtwise hole (from the tip where the screwdriver fits to the brass barrell where the other 4 holes are), does not allow the same small carb rod to go through. You would think that it would be the same size or even slightly larger. Can anyone educate me as to why that hole would be smaller thant the other 4 holes?????? on the "screwdriver" end is the .013 dia fuel jet. it only goes for a short distance. then opens up into the center of the jet body. the 8 "large" (~.023 dia) holes through the side of the jet are the air bleed holes. the fuel / air mixture then exits out the center of the jet into the idle circuit. hope this helps you. indianna kid.......You serious? Thanks for untwisting my thinking.......I thought that the gas went in at the end with the screw driver head, and then passed through the 8 small holes in the side of the brass jet. I just measured the wire that I pulled from my wire brush, and it measures .32mm (.0125 inch), which is a relief in that it is half a thousandths smaller (.0125 wire vs. .013 jet hole) than the hole......no wonder it was going in tight until I finally had all the gunk cleaned out. Shoot, even a sewing needle was too big to go through. Thanks for educating me about these wascully jets. The link is no longer active? I too am looking at rebuilding and there's are so many options and opinions it's nerve racking and scary!